Marcia said... Please enter me in your giveaway. I love my mother because she is still eager to learn and try new things (especially foods) at age 79. She wants to try Greek yogurt but our little local store does not carry it. So, I want the Greek yogurt for my mother. Congrats marcia! I've sent an email so please get back to me with your contact info! I had a really awesome Birthday and now I want to share with you! Recently Yoplait and My Blog Spark sent me a “Nourish Your Inner Goddess” gift pack so I could try out the new Yoplait Greek Yogurt. The gift pack included: a super soft bath wrap, slippers, other bath goodies, and coupons for 2 free Yoplait Greek yogurt cups. I have noticed all the Greek yogurts popping up in my grocery stores. With my 2 coupon vouchers I picked up a strawberry and a honey vanilla flavored cup (blueberry and plain also available). The packaging boasts of having 2x the protein (12 grams to be exact) of leading yogurts and 0% fat. For being fat free (plus having more protein) I thought it was pretty tasty. I didn't notice any after taste (like with Splenda) in either flavor. I did notice that the strawberry flavor was a bit more smooth than the honey vanilla flavor. What I loved most (besides the 12 grams of protein) was that these yogurt cups aren't overly sweet. The Greek strawberry 6oz cup has 18grams of sugar when compared to the Original Yoplait strawberry flavor which has 27grams of sugar per 60z cup. The Greek strawberry only has 130 calories per 6oz cup making it a pretty good snack! So leave me a comment for your entry to win your very own “Nourish Your Inner Goddess” gift pack. Tell me anything, which flavor would you like to try? Why you love your mom so much? How do you relax? anything really! I'll pick a winner on Saturday evening. Update 5/3: Good question by one of my readers, I'm not sure if Yoplait/My Blog Spark is willing to ship internationally so I will double check and get back to you ASAP. You may still leave a comment just in case they do! Update 5/4: I was informed that this giveaway is for residents of the continental US, further more they will be unable to deliver to a PO Box. Sorry to my international readers. Well, first of all, let me tell you that I think you are one very talented woman. I found your blog while searching for info on painting on fabric techiques. I came across your post about using Prisma pencils and textile medium. I participate in the Bead Journal Project and intend to try this technique on my next page. So thank you. I hope it works for me too!! I'd like to win your giveaway. Actually I would give it to my daughter who runs through the house with a towel wrapped around herself after her bath! I love yogurt and eat it for lunch every day. My way of relaxing after work, after supper and dishes etc is to sit in my recliner, or if I'm lucky and the weather is nice on the deck, and either bead or do hand needlework. tu sorteo es internacional? acá no venden yogurth de vainilla lo cual es lamentable, porque lo he probado en USA y es buenísimo!!! qué bien que pasaste un buen cumpleaños! Oooo! I tried a greek yogurt. It had chocolate on the bottom. 'Twas yummy. Haven't tried the yoplait though. Who doesn't love more protein?! I did want to try out the honey flavor. Yoplait Greek yogurt was spotlighted on Biggest Loser. I think it was Yoplait anyway. I love BL's blatant product placement. Brian hates it. If you gotta do it, make it as obvious as possible. Glad your bday was a good one. Thanks Norma, I love Greek yogurt. I didn't know that Yoplait was making it. I love my mom because she has always loved me, even when I was hard to love. I'm all about free stuff and I have tried the Greek Yogurt. Good and good for you. I like the blueberry and my kiddos even liked it! My old roomie is from from South Africa and several years ago kept asking me why American yogurts were SO sweet and where is your Greek yogurt?? Huh? Now she's a happy gal and I have yet to try Greek yogurt. I'd love to taste the Strawberry, as that's what I eat daily. Oh and relaxation?!? That's a toughy. I find it relaxing to paint, alone and uninterrupted. That doesn't happen often though. :( We did go on a fab trip to Costa Rica sans kiddos in Jan. Several peaceful days on the beach...yep, that's relaxing! Who doesn't love yogurt. I have not tried the greek kind. I have printed a coupon and will try some this week. Thanks for the heads up can't wait to try it! I've tried greek yogurt and appreciate that it is less sweetened. Not sure why marketing folks decided the only way to sell yogurt in US was to overload it with sweetners and addins. I'd love to try their Greek strawberry flavor. New convert to buying Greek Yogurt... my favorite would be honey vanilla because of my allergies. I love the extra protein, low fat properties of the yogurt, but am with you re: the cost. I usually eat mine with organic granola. My mom was the best, she's gone now. We were best friends - but she taught me everything I needed to know to succeed in this world and for that I am eternally thankful. I've had the honey one, I love it! It's a treat for me, a little pricey to buy all the time, but tasty! I relax by giving myself pedicures, complete with foot soak and scrub. 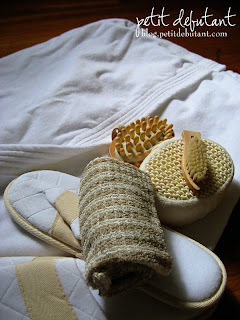 I'm a spa girl at heart and would love this little gifty! I want try the Honey Vanilla - if only I could find it. I guess a trip to Walmart is in order.